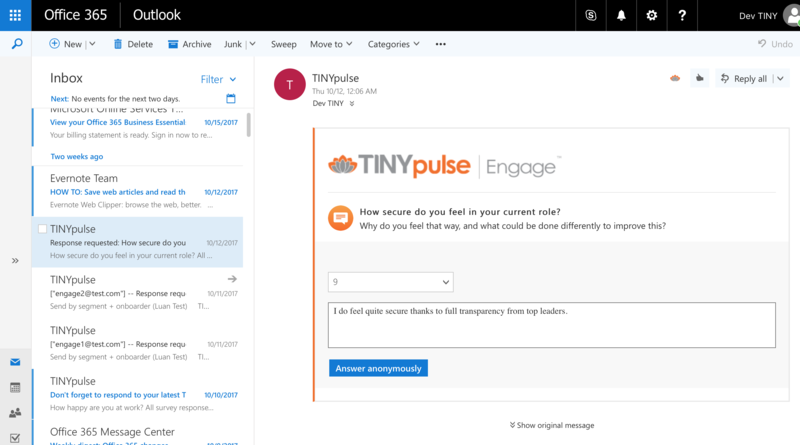 TINYpulse has partnered with Microsoft to bring you the simplest and most convenient way to respond to your TINYpulse survey with Outlook Actionable Messages. Outlook Actionable Messages let you take quick action on tasks right within email. And what better way to save time responding to your regular TINYpulse survey than being able to submit it right from your inbox? The best part of Outlook Actionable Messages is you don't have to do anything! If you're using a qualifying version of Outlook, you'll get the special Actionable Messages version of your TINYpulse survey automatically. Just open your survey email, and respond directly within Outlook without ever having to redirect and sign in to TINYpulse. If you love Outlook, take a moment to download the Outlook add-in for TINYpulse to send Cheers right from your inbox!